Dealing with a garage door that struggles can be endlessly frustrating to begin with when you have places to be, but it’ll only get worse if you continue to use it in that state! It makes the whole system strained attempting to work with parts that need to be repaired and creates even more damage. Rather than waking up to find that your door won’t work at all when you need it, make sure you get those repairs done as soon as possible! The springs of your door can be dangerous if a professional doesn’t handle them carefully, which is why we’re here to take care of them for you in no time! We can replace both tension and extension springs, so whichever you have, we can handle it. While we’re there, we’ll also check the other springs to ensure they’re still in good shape, as well as test the door to confirm that it’s functioning properly. Our years of experience in the field mean that we’re deeply familiar with all the major brands of openers! So, whether you have Craftsman, Genie, or otherwise, we’ll be able to get it working again right away. Sometimes it’s something as easy as a part needing repairs or to be switched out, or the whole opener may need replacing if it’s too old. In either case, we can do it quickly and have your door working again in a snap. Sometimes wear and tear from daily use will cause the tracks your door moves along to become warped, or an accident may cause a dent. Whatever the trouble, our professionals can either fix it, or if need be, carefully replace the tracks while making sure the new ones are aligned properly upon installation. That way you can rest assured your door will be moving along easily! 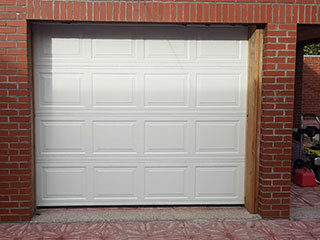 Contact Garage Door Repair Denver and get your appointment scheduled now! You’ll be glad that you did. My garage door opens a little then stops. Why is that? If your garage door behaves this way, the problem could be worn springs, but not necessarily. Truth be told, there are all sorts of things that can cause this type of problem, from bent tracks to circuit board issues. Sometimes, when trying to fix things yourself you can end up damaging the system further, so it's often better to let professionals handle the troubleshooting and necessary repairs. Garage door won't open manually. How come? If your garage door won't open manually, chances are you have broken or worn springs, or something wrong with the lift cables. The main purpose of these units is to do the heavy work of raising and lowering your door, which means they'll begin to suffer the effects of wear and tear over time. It can also be other issues such as warped tracks, broken rollers or various other things. Rest assured, though, that our experts will have no trouble locating and solving the problem for you. Garage door roller popped out. What do I do? The rollers help the door move by guiding the panels along a fastened set of tracks. When one or more of them pops out of the track, the door will usually get stuck. While it's possible to simply push the rollers back into the place, you need to find out why they popped out in the first place. More often than not, this is due to bent track sections or some other physical damage, or even a blockage that prevent the rollers from moving past it.